In a career spread over 30 years and four continents, Dr. Rizvi has held several academic appointments, along with positions in international organizations, not-for-profit institutions, media and the government. He is currently serving as the international affairs adviser to the prime minister of Bangladesh. 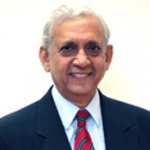 Dr. Rizvi has considerable hands-on experience in institutional management, international development, negotiation and conflict resolution, higher education and training, and capacity building protocols. He served as director of the Ash Institute for Democratic Governance and Innovation, and as a lecturer in public policy at the Harvard Kennedy School between 2002 and 2008. In 2008, he was appointed vice provost for international programs at the University of Virginia. Dr. Rizvi has contributed significantly to academia: his publications span the disciplines of history, politics, international relations and development economics, and include several renowned books, such as “South Asia in a Changing International Order”, and “Bangladesh: The Struggle for the Restoration of Democracy”.